Pictures should tell a story just like words do, so that even with no audio you could more or less tell what is going on. Would the story make sense if the sound was turned down? There should be a logic to the sequence of the pictures. Continuity editing is still the dominant style in the UK TV including news. This comes from the film tradition and involves creating edits that are as seamless as possible, giving the illusion of more than one camera filming at any time. Keep the editing simple. We shouldn’t ‘see’ the editing. The editing is there to help make the story clear. Start with your best shot. Look for action. Avoid static shots. A picture that establishes what the story is about. Usually not a pan or a zoom unless for a special reason. Avoid cutting on a move. Let a pan start and finish. They same with a zoom. Avid two moves one after the other, especially two zooms, or two pans together. Use a variety of shots. Wides, followed by close ups, followed by a move – that sort of thing. Use ‘cutaways’ to shorten action to the length you want. You’re not showing everything, but giving a sense of a particular activity. Try and let movements/actions finish. Have people walking out of shot, especially in a ‘set-up’ before an interview. Avoid ‘jump cuts’. Just as you start well, you should leave the viewer with a strong shot too, preferably one that sums up the story. It may be the reporter summing up on location in a piece to camera. If it’s not a good shot, don’t use it. That’s the point of editing. Only use your best material. So, wobbly camera work, the shot where someone does something distracting in the background should be left on the cutting room floor. No one ever sees what you left out. Sometimes you may have to leave good material on the cutting room floor because you shouldn’t cram in everything, only what you need. All news organisations have a house style. It doesn’t really matter what the style is as long as everyone sticks to it. we are issuing this brief style guide for all your work so that WNOL and any news blogs you write will retain a consistency. Writing to a style is a very good habit to nurture. Ours contains style points common to major news organisations in the UK. Use Oxford English Dictionary spellings. Use the first example where there is an alternative. Use the Times Altas for geographic spellings. Keep capitals to a minimum. Use upper and lower case in headlines just as you would in a sentence. Use upper and lower case for acronyms where you can say them like a word eg. Nasa, but all upper case where you can’t say them eg. UNHCR. Use –ise endings for words like capitalise, organise etc. (There is an exception in bodies like the World Health Organization where that is the way they spell their name). Take care not to use American spellings with words like colour (color in the US), humour, etc. Also note that words like vest, slated and suspenders all mean different things in the US. Spell out numbers one to nine, then digits for 10, 11, 12 etc. Never start a sentence with digits. Try to use short words that are easy to understand. We use a colon and then double quote marks for speech. Remember that punctuation comes inside a quote unless it’s an incomplete sentence. He told me it was a “really difficult”. Don’t use contractions, except in a quote eg. Is not, cannot, do not etc. Take care not to use trade names when you want a generic word. Common mistakes are Hoover, Portakabin, Kleenex, Biro. Hyphens. If you don’t use them correctly you can change the meaning. eg. A little used car is different to a little-used car. Companies, governments and other bodies are singular. The exceptions are the police and sporting teams. Try to close up and abbreviate units eg. 13m, 24km, £35m, 3C. Dates. If you use the figure first it avoids comma eg. 27 November 2008. If you are publishing online then you have a potential global audience where today and yesterday are confusing. Try to use the actual day instead. Make every effort to avoid commas in intros – they slow down your copy. Learn the rules on use of apostrophes and comma. They are commonly misused. Check out the draft graph of laptop in three years time. It might look so for the purpose of multi-task management screen and 3D mouse operation. Compared with present laptops, the future version will have a much bigger screen composed of one big screen and two small ones on both sides in order to perform multi-tasks better. 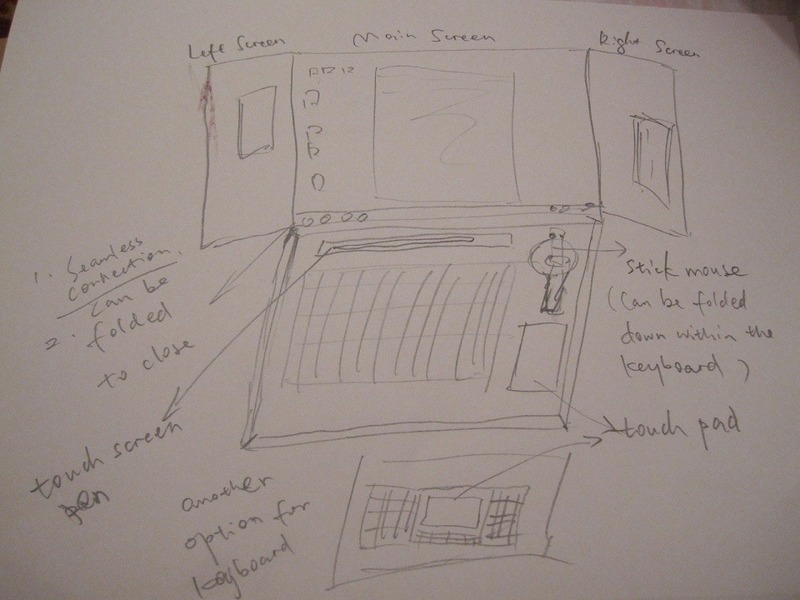 If the small screens are not needed, they can be folded to the back of the main screen or slided into the main screen. Where the smalle ones hide is not a problem. The real challenge is how to make seamless connection between the three screens. For easy control, there will be a stick mouse, with buttons on the stick, just like the controlling stick you use to fly a helicopter. This is necessay because the future system will be 3D, and a stick mouse will make 3D feel more real. I include an alternative touch pad design which is supposed to be hand sensitive, meaning you can move your hand or finger above the touchpad without actually touching it. Belgian 3D newspaper, Europe’s first? Following 3D movie, 3D game, 3D TV, now comes 3D newspaper. How cool is it? Take a minute or 2 to read through the BBC short article and then come back. Now let’s talk about something interesting. THOUGHT TO BE, THE FIRST? Nothing wrong with this piece except for that “thought to be Europe’s first 3D newspaper”. Can you use “though to be” in news reporting? Isn’t it your job to check facts in your piece? What do you expect me to get reading your “thought to be”? Well, I’m sorry, but your “thought-to-be” is wrong. 3Dvison-blog.com says that Polish newspaper Dziennik Baltycki (The Baltic Daily) has done this on 19 May 2005, long before this Belgian newspaper La Dernier Heure did the same thing. Draftclound put up a lot of photocopies of the Polish newspaper published in 2005. Below is one of them. The bigger, the better, or the worse? Another media organization who made the same mistake as BBC is ABC News. They are even bolder than BBC. A Belgian media group has published Europe’s first 3D newspaper, complete with flip-out cardboard viewing glasses. Not even BBC’s “thought to be”. Is everybody wrong on this? Not newvine.com, for god’s sake. They didn’t say it’s Europe’s first 3D newspaper, or thought to be the first. And their article source is Central Queensland News. Are media giants like BBC and ABC too big to notice minor aspects in their reporting of minor stuff? Now I understand why newspaper targeting niched readers can still survive in spite of the austere industry environment. I know a blog is better not talk about oneself all the time. I know there are certain rules to follow writing online. But I just want to jot down what I want to say right now. My wife showed me a video. That’s a gift for my birthday. Guess what? She filmed my daughter babbling “papa, papa”. I was so happy that I cried watching that short video clip. I miss them so much. Two months later, I’m going back and bring them over here with me for the rest of my study here. Just now I checked email. A teacher wrote me. Guess what again? He found my 4GB memory disk that I lost in radio class last semester. It’s already nearly 3 months, and I offically gave up getting it back. Now it magically appeared. I’m not a birthday guy. I even didn’t think about celebrating it this year at all. Well, I didn’t do so back at home, either. But this birthday I’m celebrating with my friend Valetina, because we have birthday on the same day! Rock n roll. What a beautiful day and year! I started making a short film today. I copied the idea from “50 people, one question”. Basically, you ask one question, like “what do you hate the most” I asked today, then you edit all the answers together. I’m planning to ask “what do you love the most” as well. The interesting part is that people will smile happily in front of the camera when waiting for the question. Few people really appear angry when talking about what they hate the most. Well, maybe because most of them are my classmates. I’ll try some other people tomorrow. What I’m concerned is that the sound quality might not be good because I’m using the on-camera microphone. This is what I got from university for my TV course. Using connected microphone will be too complicated because I’m working alone. I don’t want to set the camera on a tripod. One good thing I found today is that I’m having a steady hand now. I tried last semester, but it didn’t work out well. Last week David was filming in class when some guest speakers gave us lectures. I looked at how he was holding his small camera, and I learned his way. My short film might not be so good as expected, but anyway, I’ll finish it. One picture is worth 1,000 words. The cliché says. 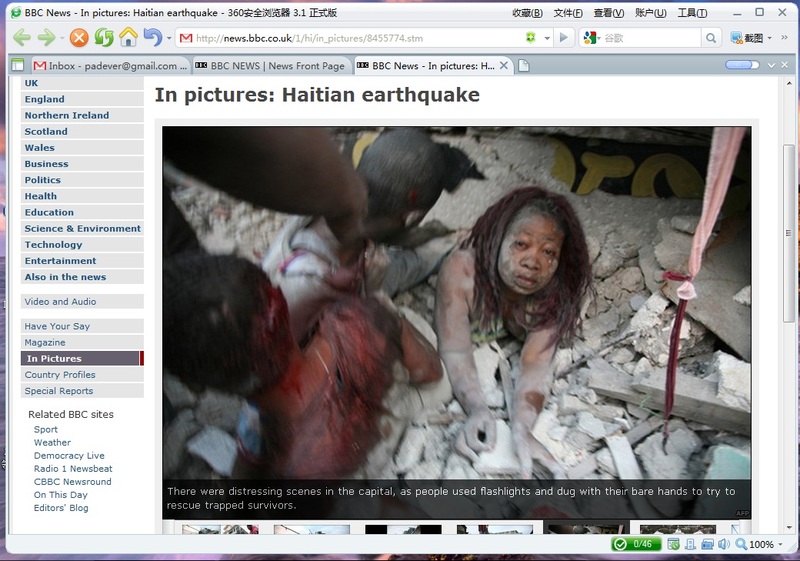 However, BBC’s selection of pictures about Haiti earthquake seem quite inappropriate. This picture has strong visual impact, isn’t it? Click on it or go to BBC website to see it in enlarged size. Look at it very carefully. Now tell me how you feel. Don’t you think that BBC is actually ‘playing’ with people’s miserable life, even if just slightly? The women with a dust face got her body below chest stuck in ruins, together with another two who were almost unidentifiable, one of whom had his/her head and body in red blood. Is it appropriate that BBC published this photo? BBC didn’t take this photo. It was from AFP. In fact, none of the 17 photos in its gallery was credited to BBC. Most of them were from AFP, several from AP and Getty Image, and one from the Red Cross. This explains why you can see the same images in other media such as The Times or The Telegraph. 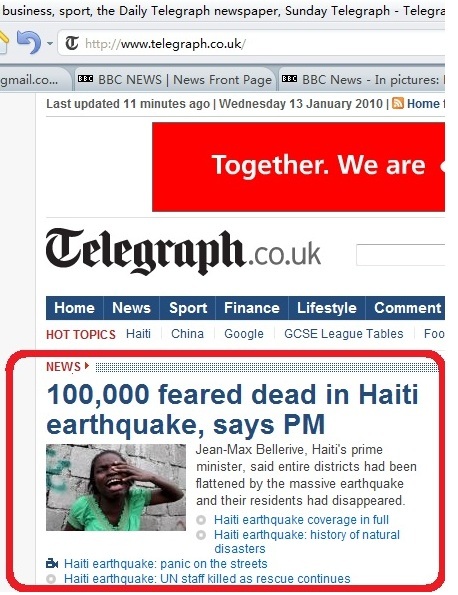 However, neither Times nor Telegraph selected that photo that BBC used. If you go through all the photos, you’ll see they are more reserved than BBC in using photos that feature seriously injured people. The answer to this question is simple. It’s the editor on duty who decides which photos get published. However, the question might actually not so simple as it looks. Behind the simple ‘go’ or ‘down’ decision is the style, or principle of each media institution. BBC saw that picture, so did the Times and the Telegraph, most probably. But they made different choices. BBC knew well that some of its photos including the one we talked just now might offend some people, so they put up a warning on the first page saying “This gallery contains pictures some readers might find disturbing”. But does that justify its ‘playing with people’s miserable life’? 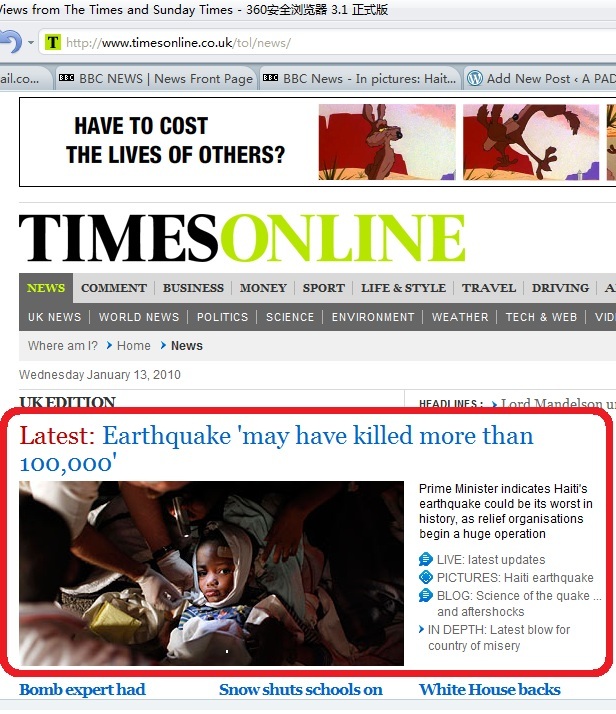 I’m not a person who gets easily disturbed, but this picture really makes me feel bad about those Haitians hit by the earthquake, especially how their catastrophic lives were depicted by BBC. * Studying Journalism in UK. * Blog about news writing and reporting, and life in UK. * Write me: chinawangyong AT gmail.com. elevatorstuck bass boosted on TV talenet show exposes China’s race issue. Or, really? Damien on Funny pictures – beggar or police?